Competing in the searing heat of Shanghai, Sotsaka and partner Brad Betts took third place in the gruelling heavyweight men’s doubles race. The 22-year-old Sotsaka, who is in his final year of a BSc maths degree, said the medal was reward for the hard work they had put in this year. “Excitement was definitely the dominant feeling once we had crossed the finish line,” he said. He added it had been “without a doubt my proudest achievement”. 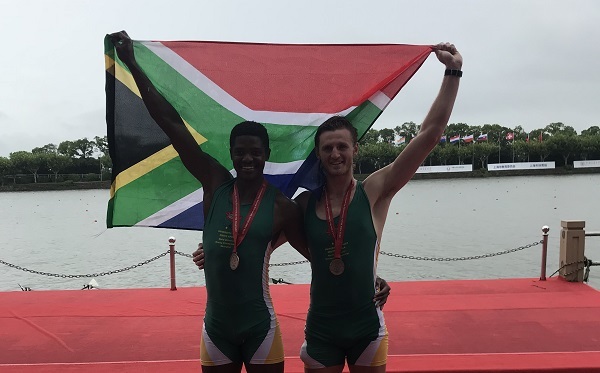 Sotsaka, from Hatfield in Pretoria, said it was often difficult to know what to expect going into an event such as the FISU World University Rowing Championships. “Some years you find yourself up against some very experienced senior crews, and other years you’ll race against top-end U23 rowers. He added that there were several hurdles to surmount on an occasion such as this, not least of them getting used to different meal options. “However the heat and humidity was certainly the biggest challenge. The UJ rower said his partnership with Betts, of Rhodes, was a crucial part of their success. “Brad is an extremely intelligent person, both on and off the water, and he and I clicked immediately when we were paired together in the double. “Having him as my bowman [the rower closest to the bow who controls the boat] brought me great confidence. Sotsaka, who grew up in Watermeyer in Pretoria, said he was influenced to take up rowing by his older brother. “Katlego, who has always been a great mentor for me, started rowing at school around 2008 and he convinced me to join him,” he said. He added that he had had many mentors who had helped him succeed in rowing, but paid a special tribute to Mpumi Geza. “I will always be indebted to Mpumi, who coached me to my first international medal – he is the unsung hero in South African rowing. The next step, Sotsaka said, was to try to break into the senior national team.